The best knife is one that you can deploy quickly and efficiently, with minimal trouble. And if you have got this Z-Hunter Green Folding Knife in your pocket, you have a great little blade that will serve you well in a variety of different situations. With its two-toned blade of black and silver stainless steel, there is not much that his knife will not handle. The spear-point blade cuts and pierces with equal ease, and small serrations near the blades base allow for the user to utilize a sawing action when needed. 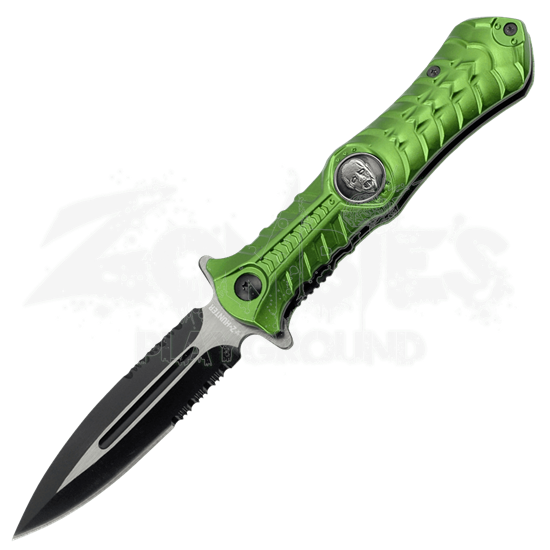 The bright green aluminum grip is textured and contoured to fit easily into the hand and provide a secure grip, while also being decorated with a dark grey corpse medallion, to better give the knife a zombie apocalypse style. This is an action assist folding knife, which means the blade deploys quickly once the user starts to open it, and thanks to the pocket clip, it is a knife that can kept within easy reach, too. So pack it along if you plan on setting out on your own zombie survival mission, or tuck this Z-Hunter Green Folding Knife into your pocket as an everyday pocket knife to use as the need strikes you throughout your day.